Once upon a time it required thousands of dollars and a professional installer to have video surveillance in your home or business, not to mention the ability to watch it remotely. Those days are thankfully gone. Today for around $50 you can purchase a camera, install it yourself in just a few minutes with no real technical knowledge and if you have a smartphone or tablet watch it from anywhere in the world any time you want. These are great for checking on your pets, watching for a delivery to be made, keeping an eye on your housekeeper or employees and even having a video record in case something happens. There are a lot of cameras and systems out there to choose from but I will be talking about the latest trend of totally self sufficient wireless cameras. These do not require wiring (other than plugging into a wall for power) or dedicated controllers (or Digital Video Recorders) like many systems you find for sale online. They are also the most economical to buy and deploy. We have to start by defining what we want the cameras to do for us. There are different cameras needed for mounting on a pole outside and reading license plates at a distance, say for example at a car lot, than putting one in your living room to see which one is climbing on your furniture while you are away. I generally tell my clients to sit down and draw a very rough sketch of the floorplan of the home or business where they want to install the cameras. Then I have them put an X in the area where they want the camera to look and put notes on specifically what that camera should be doing. This includes such things as if it needs to be able to see a specific object, read a specific thing, be able to see at night or not, etc. Once I have this I sit down with them and make sure there is power near where the camera might go and if not, how to get power there. We also discuss how to mount the camera or what to sit it on if there will not be a mounting. Now we talk about if the camera will record and if so where it will record to. How much recording time do they need and how much security for the recordings to provide. Many people only need streaming as they only want to be able to watch something in real time. Others only need recording for a day or two so they can check to see what happened that day or the previous day. Some on the other hand need a couple weeks or more. Where the data is stores makes a difference too because if the data is stored only on the camera or a DVR on the premises and you want the cameras for security it may be stolen by thieves during a robbery. Off site is the best solution although that generally requires a monthly fee. There are other solutions which offer combinations of these methods to provide enhanced security while reducing or eliminating costs which we will discuss. With the huge amount of different cameras out there it is important that we know a little about them so we can pick the right one. There is no need to pay for features we can not or will not ever need but then it would be foolish to buy a camera that does not have the features we need to do a specific job. The most talked about specification it seems is the resolution of the video the camera will deliver. As with regular cameras they make you think you need the highest resolution you can find and this is simply not true. 1080 is the resolution of the higher end cameras today which means they shoot video at a resolution of 1920 pixels wide by 1080 pixels high. This makes for very sharp video that delivers a lot of detail. You need this resolution if you need to identify specific objects in the video such as denomination of bills when used watching cash transactions, people’s faces at a medium to long distance or license plate numbers a those same medium to long distances. 720 is the resolution used by most mainstream and some economy cameras and delivers a video at 1280 pixels wide by 720 pixels high. This is an excellent resolution for most video applications at short to medium distances where extreme detail is not required. 720 is more than sufficient for identification of people and vehicles in smaller areas. Older video cameras and some of the very inexpensive may shoot at resolutions of 640×480 or if you have a non-digital system you may see 720×480 or 705×480 resolutions. These may be enough to make sure an employee is actually at work, or that someone is in your home when there should not be but that is about as much as you will get out of it. As cheap as the 720 cameras are there really is no reason to use something with less. Most cameras today can see in the dark. They do this by either using IR lighting which our eyes can not see or by using very expensive sensitive cameras. 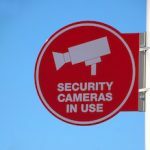 Since this article is focused on home and small business uses the extremely sensitive cameras are a little out of the budget we want to keep to. When the typical cameras switch to night more a few things happen; one or more IR lights on the camera turn on illuminating the scene with invisible light and the camera switches to black & white mode instead of color. 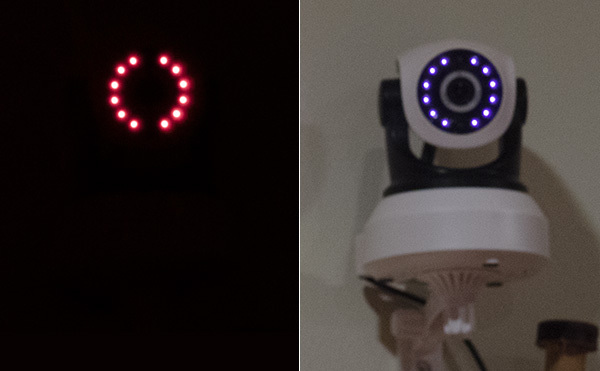 The IR light or lights on the front of the camera can actually be seen to glow a faint red. This is especially evident in complete darkness but is not so bright as to attract a lot of attention (even though the image above looks quite bright). In some cameras these lights can be turned off which can be a useful feature that we will discuss later. If this light is turned off, fails to function or is insufficient for your needs additional lights of varying brightnesses and coverage areas can be purchased and installed in any location you choose. This makes it easy to light large and/or complex areas. Many cameras today allow you to move or zoom the camera while viewing the video. These are typically called PTZ cameras as this stands for Pan, Tilt and Zoom. This comes in very handy for tasks like keeping an eye on pets while away or watching children play in the back yard. Cheaper cameras use digital zoom which does very little other than make a section of the screen bigger. It does not increase the resolution so even though something does increase in size it does not make it any easier to identify or read. More expensive models may include optical zooms which magnifies the view and does make things easier to identify and read. The optical zoom feature is ideal for reading license plates or identifying people at a distance while you are viewing it in real time but has no effect on previously recorded video. There are three typical ways to connect your camera to something for recording or viewing the video; WIFI networking, wired networking and analog. Analog is the least desirable in most cases because of its low resolution although it does have the advantage of being the easiest to cable should you have no wireless or wired network where you need to go. Analog cameras typically have two connections; a composite video and a power. These often are fed from the DVR to the camera using what is called a siamese cable which combines both cables into one for the run to the camera from the DVR. This makes it very easy to put a camera anywhere you want one without having to worry about having WIFI coverage, a networking cable or power anywhere near the camera. Wired networking is nice if you already have a network jack where you want the camera or if you are installing the camera while building the building or remodeling and can easily run network cable to the camera. As a side note, you can power many cameras using what is called POE (Power Over Ethernet) as long as you can connect a POE injector (a device that goes inline in your network cable and plugs into the wall as well to provide electrical power through the ethernet cable). Using POE in this manner has all the advantages of the analog cable in that you can run one cable to anywhere and stick a camera on the end but also provides high resolution video and direct streaming (we will cover streaming methods in a few minutes). A potential problem for POE is that my experience has seen that locations where lightning or power problems (power outages, brownouts, dirty power) are frequent can cause a lot of problems with POE systems. In one case I have a customer who uses a switch that provides POE power and it has been replaced many times over the past ten years due to lightning. People inside the city limits of a town of any real size should not face too many of these problems but it is something to keep in mind before you do any POE installations. WIFI networking is the top seller today because it is the easiest to set up and get running if you do not have networking cables or analog cables already installed where you want every camera. They are also very easy to move from one location to another. The downside is that they can use a lot of wireless network bandwidth and really slow down other wireless devices in your home or business. The bandwidth issue can be mitigated by using on camera video recording and/or not watching multiple cameras all the time. This is of course a tradeoff because storing recorded video on the camera can be a problem if the cameras are stolen. How the camera records can be an important consideration if you plan on recording video. Not every installation requires video recording so this may not apply to you. Cameras can record directly to built in internal memory or memory cards which may or may not be included with the camera. If you want to record using this method it is better to get a camera that uses a user replaceable memory card such as an SD or micro-SD card. Be sure to find out what the speed of the card should be (for example a class 10 card is typical today) and what the largest supported card size is (64GB is typical with many of these). Purchase a card too slow or too big and the recording may not work at all. Cameras can also record to a central DVR (digital video recorder) and this is very common for analog systems. I try to stay away from these systems except for larger installations as it gives you a central point of failure that can bring down the entire system. If the DVR fails then no cameras work at all. The advantage to these systems is that since all video is stored in one place it is easier to review video and find what you are looking for if you have a lot of cameras. These are also usually cheaper and when using the analog systems, easier to install. Some cameras also allow you to record to FTP sites, cloud based servers and NAS devices. FTP servers are perfect for uploading still images when the camera sees motion. An FTP server can be included with your website if you have one, or can be on any server where you can set up a public FTP site. Cloud based solutions are typically provided by the camera manufacturer and have a monthly cost. For this price the video, or images from the video, are stored online where you can access it. This solution is perfect for providing protection not only from theft but also from fire, flood or any other kind of potential loss. NAS devices (network attached storage) are normally found in businesses or homes of people who are very much into technology and can store a lot of video. This is a great solution if you need to store video in a central location for a long period of time. It also works well if you already have a NAS device since you will have no need to pay for memory cards for each camera. There are two basic types of streaming you will encounter; independent streaming where each camera can stream video directly to a device for viewing and collective streaming where the cameras send the video to a DVR or other control device and then the video is sent back out from that device to a phone, tablet or computer for viewing. Independent streaming has the advantage that if any one device fails, the others should continue to stream. Collective streaming depends on the DVR to send the video back out so should the DVR have an issue all your cameras fail to stream. Cameras that connect directly to your network are usually independent streaming devices whereas systems that use analog cameras typically stream from the DVR or controller. Lastly cameras can be made to go outside or inside. While outside cameras can certainly be used inside, inside cameras should never be used outside. The moisture in the air alone can cause the camera to fail if it is not designed to be used in that environment. In part 2 of this article we will discuss recommended cameras, the installation and the operation of these types of cameras.